During the second half of the eighteenth century the manufacture of cotton began to replace that of wool and the introduction of machinery brought about the decline of the domestic system. The invention of spinning machines  the spinning-jenny, water-frame and mule led to the building of water-powered factories. 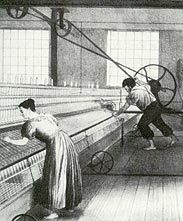 The first spinning mills in Burnley were therefore built near rivers. The patenting of the steam engine freed the mills from the reliance on waterpower, and in 1790 steam-power was used in a new cotton factory at the bottom of Sandygate. Although a power-loom was invented in 1785, it was at first cumbersome and inefficient. Its adoption was slow and weaving continued to be done largely by hand. Indeed, handloom weavers regarded the last decade of the 18th century as a “golden age” when even an ordinary weaver could earn a good wage. It has been estimated that as late as 1830 there were three times as many cottage weavers as factory weavers.